Semantion Registry and Repository 3.3 is a J2EE component-based registry and repository that implements OASIS/ebXML Registry standard. Semantion Registry and Repository also includes features that extend OASIS/ebXML Registry standard. supports Oracle and MySQL database management system. Enables definition of any business entity. Data, documents, and images classifications. Search for meta-data, documents, and images. SOAP, REST (Representational State Transfer), and JMS communication interfaces/providers. Secured registry and repository communication supported by XML signature, XML encryption, SSL, role-based security and other security solutions. Configurable automatic email notification for all registry and repository changes. Flexible configuration via an XML configuration file. Semantion RIM is a J2EE software that implements OASIS/ebXML Registry Information Model (RIM) Specification. 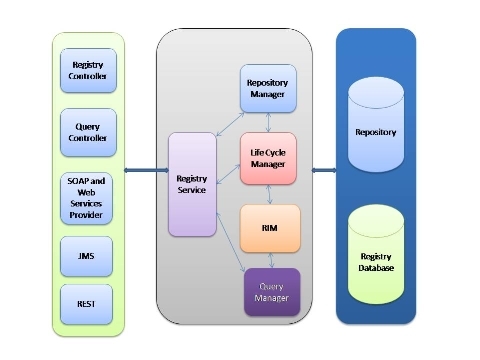 Semantion RS implements both LifeCycleManager and QueryManager, OASIS/ebXML Registry Service interfaces. Semantion RS is designed to be secure, reliable, and scalable, thus making it a solid foundation for robust Registries that will support global business information exchange. LifeCycleManager uses Semantion RIM for Semantion Registry database access. It supports the following registry operations: submit, update, remove, approve, deprecate, and add/remove slot operations. QueryManager implements OASIS/ebXML Registry Services filter queries and SQL query. Semantion Repository implements repository interface that includes the following repository item operations: insert, update, remove, and get. Semantion MainService implements a registry service access to the Semantion Registry and Repository. Using just few standard high level methods, you can program a full access to the registry with just few lines of code. Semantion Messaging is a SOAP client component that supports SOAP communication with the Registry. SOAP attachments that enables you to send and receive business documents are supported as well. Semantion Util includes common Semantion utility classes.